I participated in the July DUR Activity contest. This time i decided to be qrv from the Triebenberg in JO61XA. Because the hill is not open for everybody (there is an external laboratory of the Technical University of Dresden) i had to build up the antenna at the base of the hill. The Triebenberg is the highest hill in the area of the city of Dresden. The activity during the contest was much better than last time. This was mostly because of the OM´s from DF0MTL beeing active from JO61JF. 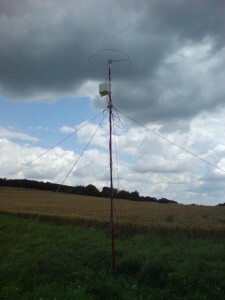 Therefore i had only few time for 2m operation but i had only a bigwheel antenna with be anyway. At 23cm i am still using my tiny hybrid-quad antenna which appears not to be competitive ;) Next time i might use another QTH and another antenna, of course. After the contest i had to hurry up because the rain front came close really fast. 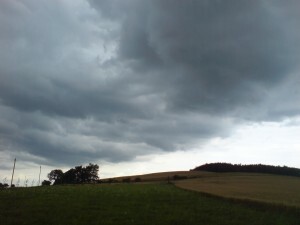 Two minutes after i had all the stuff in the car heavy rain started. Hope to hear you next time !